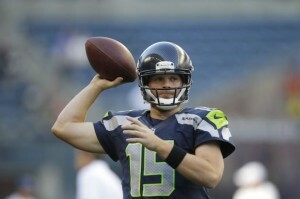 Matt Flynn remains the property of the Seahawks, multiple days after reports emerged that he’ll be traded to the Raiders. But the widespread belief for now is that the trade will indeed get done, and that it will happen soon. The two teams have haggled over draft-pick compensation, with former Green Bay colleagues Reggie McKenzie and John Schneider, now the General Managers of the Raiders and Seahawks, respectively, twisting each other’s arms to get the best possible deal. If/when (when) Flynn becomes a Raider, the question becomes whether the Raiders will remain interested in West Virginia quarterback Geno Smith (if they ever were in the first place). With Flynn not getting huge money and with the Raiders still lukewarm on Terrelle Pryor, the Raiders could take Smith with the third overall pick. The other practical consequence of Flynn’s arrival in Oakland will be the departure of Carson Palmer, either by trade (with a greatly reduced contract) or by release. He reportedly is interested in playing for the Cardinals or 49ers. (We still think the Seahawks make the most sense, if he truly prefers being a backup on a contender to being the starter for another struggling team.) If Palmer lands in Arizona, that’s another top-10 team that could pass on Smith. Now that the Bills have Kevin Kolb and Tarvaris Jackson, they could be out of the running for a rookie quarterback in the top 10. That’s three teams reportedly interested in Geno Smith and/or Matt Barkley who could be passing on passers at the top of round one, which could fuel a slide for all quarterbacks out of the top 10 and, barring a trade, straight through the teens. Unless, of course, Shaun King of NBCSN’s Pro Football Talk is accurate in his strong belief that the Jaguars will take Smith with the second selection in the draft. 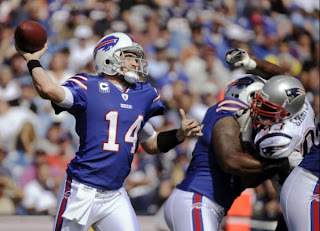 Kevin Kolb is close to becoming the quarterback of the Buffalo Bills. 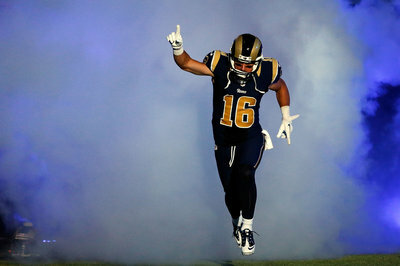 Adam Schefter ‏of ESPN reports that the Bills and Kolb are finalizing a deal tonight that will land Kolb in Buffalo. PFT reported the Bills’ interest in Kolb on Friday, and getting the deal done would give Buffalo a player who would be considered the favorite to win a training camp competition with the only experienced quarterback currently on the roster, Tarvaris Jackson. Kolb landing with the Bills also takes him out of play for the other teams who are reported to have interest, including the Jets and the Raiders. Oakland was believed to be considering Kolb in case a deal to acquire Matt Flynn from Seattle (and to get Flynn to take a pay cut) can’t be worked out. After showing some promise early in his career with the Eagles, Kolb was a major disappointment in Arizona. Bills fans will have to hope his third stop is the charm. The “imminent” trade involving Seahawks quarterback Matt Flynn appears to be with the Raiders, who would cut Carson Palmer once a deal gets done. The Seahawks are deep in talks with Raiders on a Flynn trade, sources told Ian Rapoport of NFL Network. The last holdup appears to be that the Raiders want to take one more shot at trying to convince Carson Palmer to take a pay cut and stick around on a revised contract. But Palmer is reportedly dead set against taking less from the Raiders, so it will apparently be Flynn who’s leading the Silver and Black in 2013. Assuming the deal gets completed, Palmer will become an unrestricted free agent, and the speculation will immediately begin that Arizona could be his next home. With brothers Peyton and Eli Manning destined to meet once again on the field this year, another set of quarterback brothers could be headed to the NFL. This one, for now, is on track to be more like Carson and Jordan Palmer. Jordan (coincidentally) Rodgers, the younger brother of Packers quarterback Aaron Rodgers, has completed a college career at Vanderbilt and is preparing for the NFL draft. Gil Brandt of NFL.com writes that the younger Rodgers “threw it pretty good” at a recent Pro Day workout, despite being limited by a groin injury. 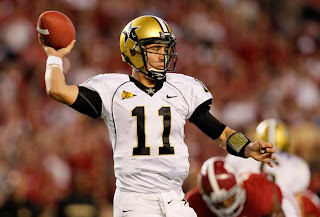 Brandt believes Jordan Rodgers will go undrafted, getting his initial chance as a camp arm. Still, players like Kurt Warner and Tony Romo also were undrafted. And Jordan Rodgers definitely has the genes to thrive. He’ll get his chance; it’ll be fun to see what he’s able to do with it. When owners and teams treat football like a business, media and fans shrug. When players do, it’s regarded as an affront to the integrity of the game. It’s not fair, but that’s the way it is. And Raiders quarterback Carson Palmer needs to brace himself for that reaction as he tries to force his way out of Oakland. It’s obvious Palmer wants out. Two years ago, he finagled his exit from Cincinnati by feigning retirement. The strategy looked to be a failure until Raiders quarterback Jason Campbell broke his collarbone and former Raiders coach Hue Jackson lost his damn mind, giving up a first-round pick and a second-round pick for a quarterback who isn’t the guy he used to be. Now, Palmer is turning up his nose at $10 million from the Raiders, which sets the stage for the Raiders eventually to cut him — and for Palmer to play for someone else. As Mike Silver of Yahoo! 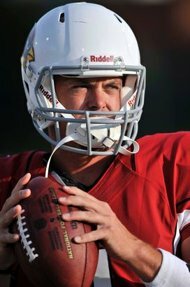 Sports explains it, Palmer wants to play for a contender, even if it means being a backup. (Cough . . . Seahawks and Pete Carroll . . . cough.) Of course, Palmer won’t get $10 million to be a backup, but his willingness to walk away from football in order to get out of Cincinnati proves that he’d be willing to walk away from $10 million in order to get a shot at winning. Palmer’s posture also reflects a belief that, despite the hiring of G.M. Reggie McKenzie and coach Dennis Allen, Palmer doesn’t see the silver-and-black bus getting turned around in the immediate future. Otherwise, he’d gladly take $10 million to stay put. The problem is that the Raiders currently hold all the cards. With no seven-figure trigger in Palmer’s deal, the $13 million doesn’t become fully guaranteed until Week One, which means the Raiders can cut him much later in the offseason, if they draft a quarterback early — or if they eventually decide Terrelle Pryor can get the job done. The only risk the Raiders are taking is that, if Palmer drops a dumbbell on his foot or pops an Achilles tendon in offseason conditioning drills or otherwise suffers a season-ending injury while on the clock, the Raiders will owe Palmer his full salary. 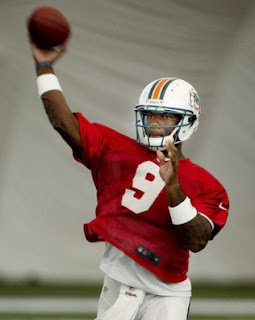 That could set the stage for a Steve McNair-style lockout. Even without Palmer being barred from the building (which would violate the CBA), Palmer is making his second power play in two years. When a team does it, we applaud. Fair or not, Palmer should prepare for the jeers and the boos and the accusations of being a chronic quitter. The quarterback competition in Cleveland just got a little more competitive. Per multiple reports, Jason Campbell has signed a two-year deal with the Browns. He joins a depth chart that currently includes Brandon Weeden, Colt McCoy, and Thaddeus Lewis. Campbell spent 2012 as Jay Cutler’s backup in Chicago, after being supplanted in Oakland by the acquisition of Carson Palmer. Chosen by the Redskins in round one of the 2005 draft, Campbell has 71 career starts. At 31, Campbell is less than two years older that Brandon Weeden, a rookie first-rounder in 2012. The Packers might have been “uncomfortable” with the idea tight end Jermichael Finely’s making $8.25 million. But they’re apparently not uncomfortable enough to do anything about it. Finley just tweeted he was “ecstatic to be back” with the Packers, and according to multiple reports, there’s a reason for that. He’s due a $3 million roster bonus tomorrow, and has a base salary of $4.45 million, which seemed ripe to be restructured. But the Packers didn’t cut his pay, and will pay the bonus as scheduled. While they probably could have squeezed him in the current climate, which isn’t exactly conducive to expensive veterans, the Packers also need him. 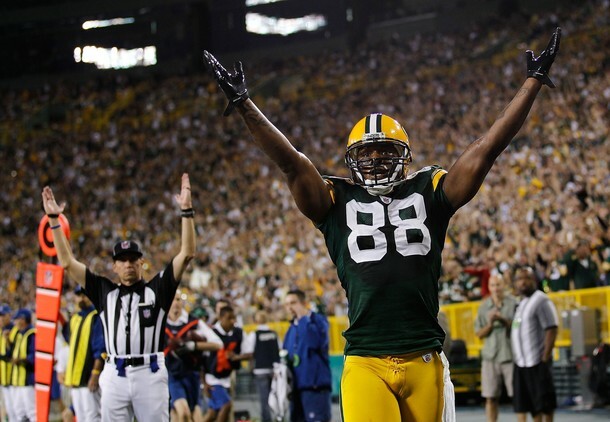 After losing Greg Jennings to the Vikings, the Packers needed to keep one of their established playmakers on offense. It looks like the Ravens have beaten the Broncos again. A couple of months after beating Denver in the AFC playoffs, they’ve reportedly beaten them out for defensive end Elvis Dumervil’s services. Mike Klis of the Denver Post reports that Dumervil has agreed to a contract with the Ravens after taking most of the weekend to settle on which offer he liked best. 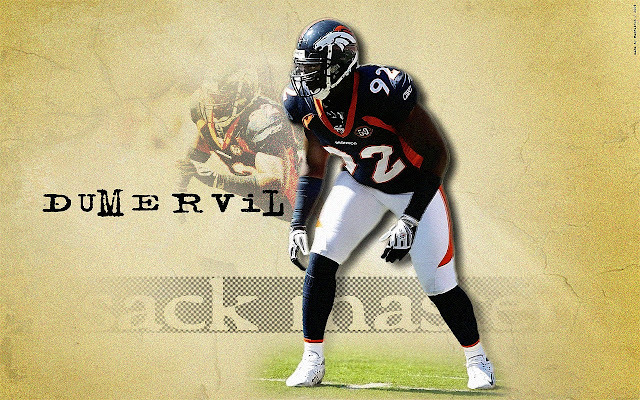 Dumervil’s departure from Denver after it appeared he’d be taking a pay cut to stay created a quick response from Baltimore, who will likely plug Dumervil into the role vacated by Paul Kruger as a pass rusher across from Terrell Suggs. It’s a move that could pay off quite well given Dumervil’s ability to get after the quarterback over the course of his career. The Broncos will have to move on to another option on the edge, with Klis reporting John Abraham as the likeliest target. Dwight Freeney would be next in line as the Broncos try to fill a hole that they never thought they’d have to fill a little more than a week ago. UPDATE 4:51 p.m. ET: The Ravens have confirmed the agreement. He will take a physical Tuesday to make the five-year deal official. The Giants and receiver Victor Cruz have been talking for months about a long-term deal, but getting nowhere. 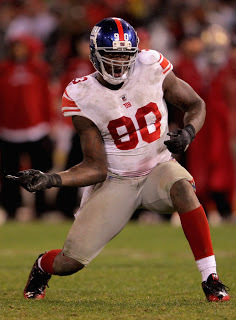 Gary Myers of the New York Daily News reports that the Giants’ offer is somewhere in the range of $7 million per year. Specifically, the deal exceeds $7 million annually, with a “sizable” amount of guaranteed money in the multi-year deal. That’s significantly more than Cruz will receive as a restricted free agent in 2013, with a first-round tender offer of $2.879 million. But the question becomes whether it’s less than what someone else will pay, either on an offer sheet now or as an unrestricted free agent in 2014. Clear lines have been drawn between slot receivers and speed receivers who stretch the field and draw extra attention — it’s currently a difference of roughly $6 million per year. With Cruz’s pending offer far closer to the top of the market for slot receivers, he may choose to wait. 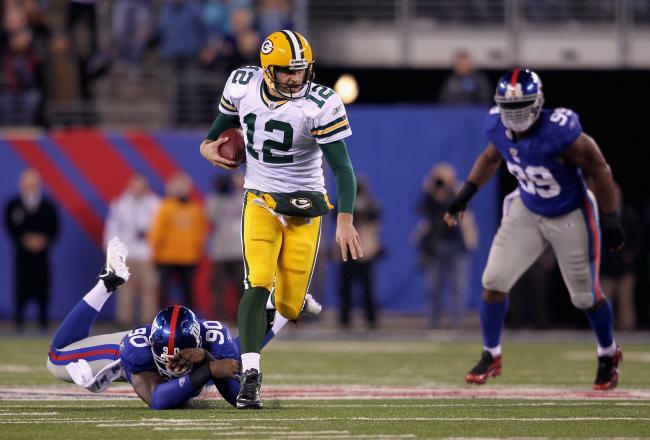 If the Giants use the franchise tag on Cruz in 2013, he’ll get more than $10 million for one season. If the Giants don’t, Cruz will hit the market on the first day of free agency, possibly pocketing far more than the Giants are offering now. Of course, Cruz would have to get through 2013 healthy. At times in 2012, it appeared he was conscious of the possibility of what a big hit could do to his earning potential. In fact, some think that the crushing blow Cruz absorbed from Steelers safety Ryan Clark has made Cruz a bit leery about going across the middle — with or without a huge payday. Regardless, Cruz ultimately will have to decide whether to take what he can get now, or to roll the dice on getting more next year. And teams will have to roll the dice on whether he can keep doing what he has done the last two years. Jets coach Rex Ryan doesn’t know who his starting quarterback will be this season, and he doesn’t even have a good guess. Ryan said the Jets have to get better at quarterback, whether that means Sanchez playing better in 2013 than he did in 2012 or someone else unseating Sanchez. A new deal with Rodgers could be done soon, possibly before the draft. 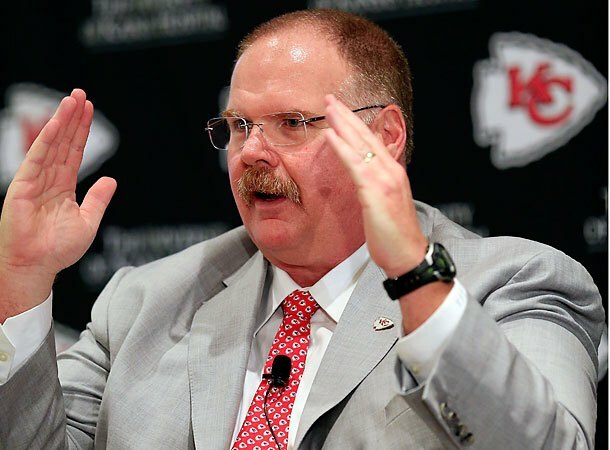 “It is his time,” a league source with knowledge of the situation recently told PFT. When it comes to value, don’t expect another nudging of the bar by a quarter inch or so. With Ravens quarterback Joe Flacco getting $20.1 million per year roughly eight months after Saints quarterback Drew Brees receiver $20 million annually, Rodgers could go as high as $23 million annually. Which then will become the new height for which other quarterbacks aim. Meanwhile, the teams with those ultra-high-priced quarterbacks will have less and less cap space available to fill out the other positions on the roster. 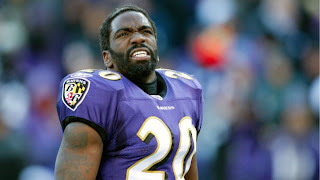 Ed Reed looks set to be playing elsewhere in 2013. 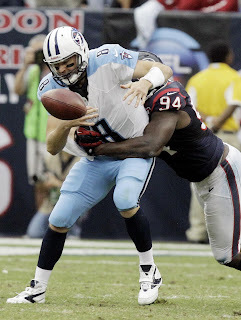 CBS’ Jason La Canfora reports that the Texans and Reed have reached a contract agreement. Brad Davis, an advisor to Reed, told La Canfora that an agreement has been struck, with only a few details to be worked out before the contract is finalized. Per La Canfora, the contract is for two years. 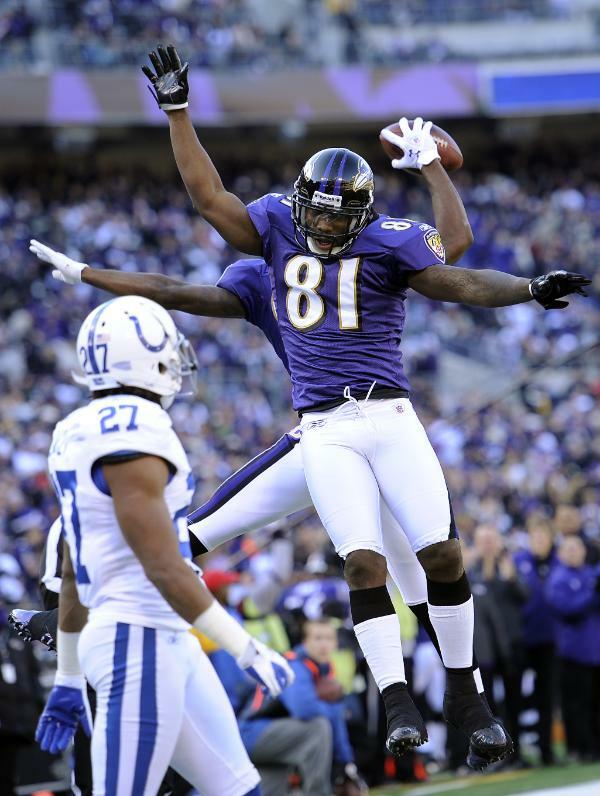 Reed, 34, has 61 career interceptions, all with the Ravens. He notched 58 tackles, defended 15 passes and picked off four passes in 2012 for Baltimore. He added an interception in Baltimore’s victory in Super Bowl XLVII, further adding to his legacy of rising to the occasion in big games. The Texans, who have yet to advance beyond the divisional round in their history, are counting upon Reed to replace Glover Quin — and to help push them forward in the AFC playoff chase. Maybe it’s just too early in the morning in Phoenix for Colts owner Jim Irsay to be too excited. The Colts have officially added backup quarterback Matt Hasselbeck, with perhaps the most low-key Twitter announcement Irsay’s ever made. Other guys have gotten multiple exclamation marks, but maybe after he referred to Hasselbeck as a “soft pillow” last night, Irsay is still a little sleepy. From a football standpoint it’s a coup for the Colts. Hasselbeck’s still enough of a quarterback to fill in for a few weeks if Andrew Luck rolls an ankle but he’s clearly OK with being a backup at this stage in his career. 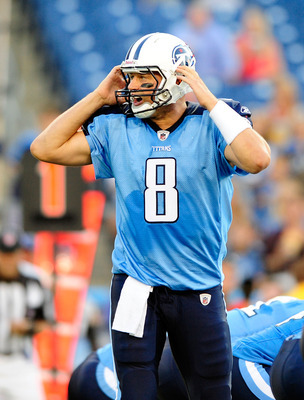 Matt Hasselbeck’s time as an unemployed backup quarterback may be short. According to USA Today’s Mike Garafolo and Jim Wyatt of the Tennesseean, Hasselbeck is “already in discussions” with the Colts after being cut by the Titans earlier this afternoon. The report said he could sign to be Andrew Luck’s backup soon. While other quarterbacks have illusions of starting, Hasselbeck is apparently past that. The 37-year-old would provide a veteran mentor for Andrew Luck, and more than replace what the Colts lost when Drew Stanton went to the Cardinals. We wonder how many exclamation marks Jim Irsay would have for Hasselbeck if they finish the deal. Lions running back Jahvid Best is in Baltimore to be honored as one of the 32 Ed Block Courage Award winners from around the NFL. Best was given the honor by his teammates after a 2012 season that never happened for the running back, who remains sidelined by neurologists who haven’t cleared him to return to football since going on injured reserve because of concussions in November 2011. The Lions have signed Reggie Bush as part of the path forward from relying at all on their 2010 first-round pick and Best has heard teammates tell him that he should retire, something that he does not plan to do. That’s a pretty big if at this point. Even if Best is able to get cleared for contact again at some point, his concussion history is a serious red flag for teams who probably don’t want to deal with the potential fallout of trotting him out there and then watching him get concussed again a short time later. The hope may never die, but it’s increasingly difficult to see it coming true either. 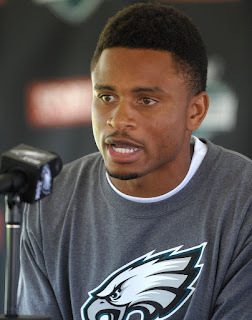 The Saints are one of the teams interested in cornerback Nnamdi Asomugha. And now Asomugha is interested in the Saints. Matt Maiocco of CSNBayArea.com reports that Asomugha will visit the Saints on Sunday. As recently explained, the relationship between Asomugha and Saints defensive coordinator Rob Ryan could be a huge factor. 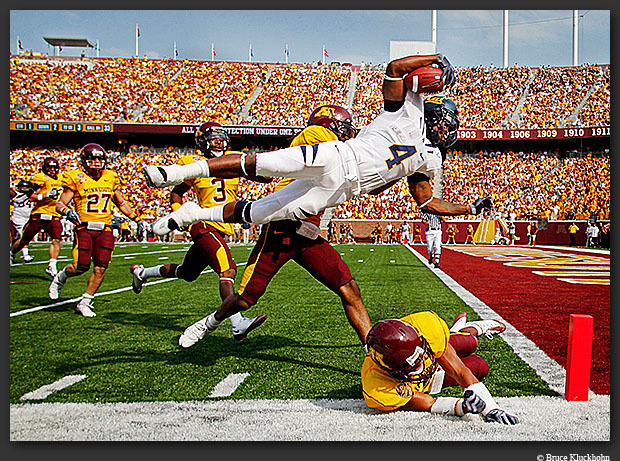 “[Asomugha] loves him and trusts him,” a source with knowledge of the situation recently told PFT. The Nnamdi-Ryan connnection, which traces to their mutual time together in Oakland, nearly resulted in Asomugha joining the Cowboys in 2011. At last word, Asomugha was in “serious discussions” with the 49ers. Other interested teams include the Cardinals, Broncos, and Texans. The Vikings have a new No. 1 receiver — and they are taking him from a division rival. ESPN’s Adam Schefter reported Friday evening that the Vikings and Packers free agent wideout Greg Jennings have agreed to terms. According to Schefter, it’s a five-year contract. Jennings was No. 4 on PFT’s Free Agent Hot 100. 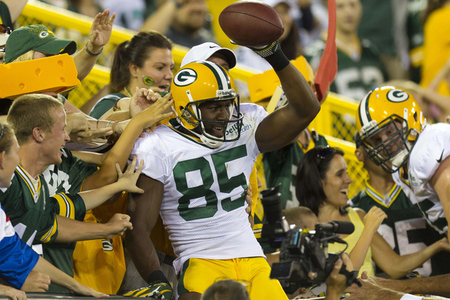 The 29-year-old receiver caught 36 passes for 366 yards and four TDs in 2012. He has missed 11 games with injuries in the last two seasons but exceeded 1,100 yards receiving in 2008, 2009 and 2010. Jennings gives Minnesota a go-to target — something the team was lacking after Percy Harvin was dealt earlier this week. Jennings’ arrival figures to be well-received by third-year quarterback Christian Ponder, who’s had an up-and-down start to his NFL career and now has a high-priced backup in Matt Cassel. 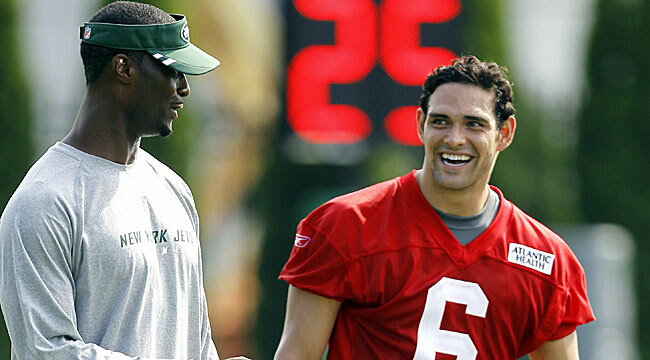 Last week, Jennings told USA Today that QB play was a decision-making factor in his free-agent process. The Packers-Vikings rivalry always creates strong feelings, and Jennings’ move to Minnesota adds another element of excitement and intrigue to two already entertaining regular-season games. How he will be received in Lambeau Field next season will be interesting. Jennings’ agreement with Minnesota leaves Dolphins offensive tackle Jake Long as the top unsigned free agent in PFT’s rankings. Signing Danny Amendola appeared to be a reflex move by the Patriots, after Wes Welker bolted for the Broncos. But according to Tom Curran of Comcast Sportsnet, the Patriots actually made their move first, agreeing to terms with Amendola Tuesday, a day before Welker agreed to his Denver deal. The Welker news came first, creating the impression of a counter-move. But once Welker turned down their offer and tested the market when it opened Tuesday, the Patriots went ahead with the Rams free agent. While this news changes the narrative, it doesn’t change the basic facts in the case — the Pats made Welker an offer, he didn’t like it, so both sides moved on. At least one person in the Tom Brady camp is not a happy camper about Brady losing his favorite wide receiver. The words “disgrace” and “disservice” were also used to describe the reaction to the fact that the Patriots wouldn’t even offer Welker enough money to keep him from signing a two-year, $12 million contract with the Broncos. The Patriots and free agent receiver Wes Welker have a lot of work to do if they want to get a deal done. That doesn’t mean those talks couldn’t start again. But it does mean the Patriots, who say they want Welker to stay with the team for the rest of his career, haven’t offered him anything resembling the kind of contract that he believes a receiver who has topped 110 catches in five of the last six seasons deserves. The problem for Welker is that teams don’t pay for what you’ve done in the past. Teams pay for what they think you can do in the future. And as great as Welker has been in New England, other teams aren’t lining up to offer him huge money because they’re not convinced he can replicate his success in any other offense. Which means it’s still possible that Welker will survey free agency and discover that no team is offering him more money than New England. Even if the money New England is offering is a lot less than Welker wants. 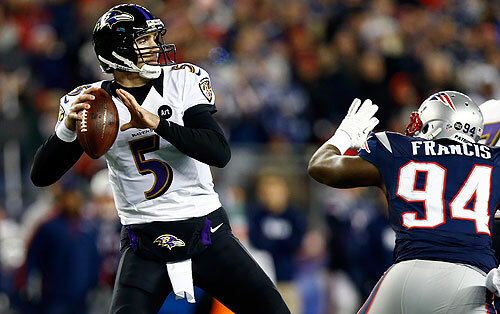 One of the breakout players of the Ravens’ Super Bowl run has found a new home. 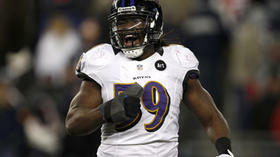 Linebacker Dannell Ellerbe has agreed to terms with the Dolphins, Aaron Wilson of the Baltimore Sun reported Tuesday. Per Wilson, the contract is for $35 million over five years. The 27-year-old Ellerbe notched 32 tackles in four postseason games for the Ravens, including nine in Super Bowl XLVII. Ellerbe was No. 39 on PFT’s list of the top 100 free agents. With Ellerbe and outside linebacker / defensive end Paul Kruger departing in free agency and with middle linebacker Ray Lewis retiring, the Ravens have lost three key contributors from a title-winning defense. It appears Ravens outside linebacker Paul Kruger’s going to be one of the first names off the board this afternoon, when the free agency period opens at 4 p.m. In fact, he may be close already. Of course, because that would be illegal, and the exact kind of pre-arranged deal the league was careful to scare teams out of making. The Ravens covered themselves for the eventual loss of Kruger by drafting Courtney Upshaw, but the Browns will view it as a double dip, adding a pass-rush specialist to their defense while weakening a division rival. Once it becomes official, of course. Which it can’t be. Officially. Not long after we reported that the Ravens are trying to trade receiver Anquan Boldin, they did. According to Aaron Wilson of the Baltimore Sun, the Ravens have shipped Boldin and his $6 million salary to the 49ers for a sixth-round pick. It’s not a surprise. The Ravens weren’t going to pay Boldin $6 million, and Boldin wasn’t going to take a pay cut. Boldin still won’t take a pay cut. The difference is that the 49ers have the cap space to afford Boldin — along with a significant need for wideouts behind Michael Crabtree. The move sends Boldin from the team coached by John Harbaugh to the team coached by his younger brother, Jim. In seven NFL seasons, Packers wide receiver Greg Jennings has primarily caught passes from Aaron Rodgers and Brett Favre. Yes, Jennings has experienced the joys of stellar quarterback play. And as he told USA Today‘s Robert Klemko in a story published Sunday, a team’s quarterback situation is one of his decision-making factors in free agency. The 29-year-old Jennings ranks No. 4 among all free agents in PFT’s Hot 100, with only fellow potential unrestricted free agent Mike Wallace and Victor Cruz (a restricted free agent) ahead of him. The Packers have a solid wide receiver corps with or without Jennings, with James Jones, Jordy Nelson and Randall Cobb all capable performers. Whether the Packers move on without Jennings remains to be seen, but this seems clear — should he sign elsewhere, he likely will have given the subject of quarterback play some thought. It remains unclear if the Bills will cut quarterback Ryan Fitzpatrick before he earns a $3 million roster bonus. The “when” is clear. With a $3 million roster bonus due on the second day of the league year, the Bills have to decide whether to pay the money and keep him, or to avoid the payment by cutting him. Option three would consist of a renegotiation that entails less money being paid to Fitzpatrick in 2013 and/or beyond. 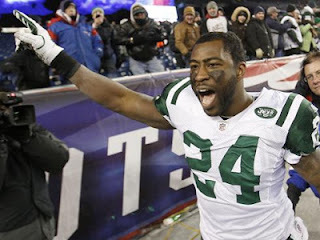 Fitzpatrick also is due to earn a base salary of $4.25 million in 2013, along with a $200,000 workout bonus. If the Bills cut him before Tuesday, they’ll carry $10 million in dead money. If they cut him on Tuesday after 4:00 p.m. ET with a post-June 1 designation, his cap hit would drop to $3 million this year and $7 million in 2014. Either way, the Bills would save $7.45 million in cash by moving on. There may be a leader in the Mike Wallace Derby. 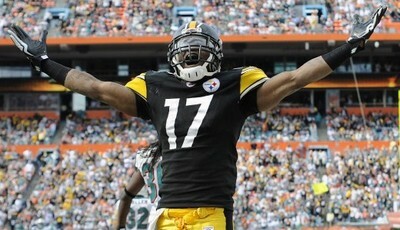 FoxSports.com’s Alex Marvez, in a story published Saturday evening, quoted a source that said the Dolphins were currently the “lead dog” for the Steelers’ free-agent wideout. According to Marvez, the climate in Miami isn’t hurting the franchise’s cause. “He prefers warm weather,” the source told Marvez. The 26-year-old Wallace is the top player available in PFT’s Free Agent Top 100. Possessing rare field-stretching speed, Wallace never figured to lack interest in free agency. According to Marvez, Wallace is expected to garner offers averaging $11-12 million annually. Now, the focus turns to whether the Dolphins’ orange-and-teal silks are ahead at the wire come decision time for Wallace. 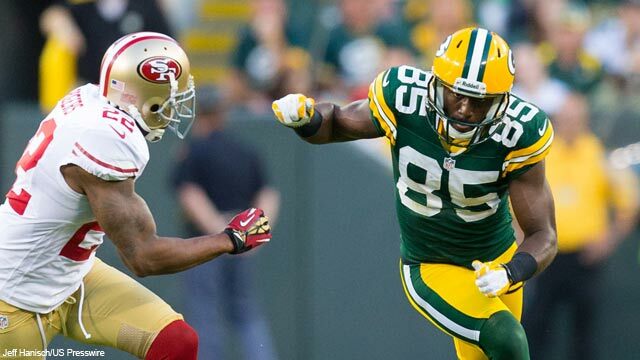 Anquan Boldin has a decision to make in the next three days: Take a pay cut or get cut. That’s the word from Alex Marvez of FOXSports.com, who reports that the Ravens want Boldin to renegotiate the $6 million base salary he is set to earn in 2013, and that if he declines, he will be released before Tuesday’s start of the free-agent signing period. The Ravens freed up some cap space for 2013 when they were able to sign Joe Flacco to a long-term extension instead of putting the franchise tag on him, but the defending Super Bowl champions are still in perilous cap shape and won’t be able to keep everyone they want to keep. Now that the Flacco deal is done, linebacker Dannell Ellerbe is viewed as the next-highest priority, and Boldin may have to go if the Ravens are going to have enough cap space to re-sign Ellerbe. Boldin said on Pro Football Talk shortly after the Super Bowl that he’d retire if the Ravens cut him, but he is apparently re-thinking that. The 32-year-old Boldin led the Ravens in both catches and receiving yards, both in the regular season and the postseason. If he goes, he’d be a significant loss in Baltimore. Former Texas A&M running back Christine Michael slept in and missed two scheduled interviews with NFL teams at the Scouting Combine. He says NyQuil is to blame. In a brief statement posted on the Aggie Sports Twitter account, Michael said he went into the Combine extremely sick, and that when he took some NyQuil it knocked him out and caused him to oversleep. Michael said he apologized to the teams he stood up. The good news for Michael at the Combine was that he looked great on the field, leading all running backs in five different workouts: The bench press, vertical jump, broad jump, three-cone drill and 20-yard shuttle. No one doubts that Michael is a phenomenal athlete. So as long as the team that drafts Michael gets him DayQuil instead of NyQuil, and an alarm clock that doesn’t have a separate knob for the radio, he should be fine. 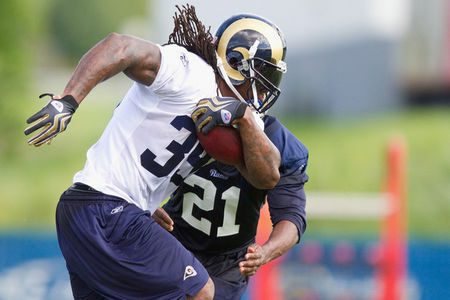 Running back Steven Jackson has voided the final year of his contract with the Rams, which would have paid him $7 million. But as he looks for the first time in his career for a new team, he says it’s not about the money. Of course, that usually means it is. In Jackson’s case, however, we’re inclined to believe him. In other words, it was about the money for the Rams. After all, they allowed Jackson to void the final year of his deal, even though he didn’t reach the triggers necessary to make it go away. If Jackson hadn’t voided the last year of the deal, chances are the Rams wouldn’t have wanted to pay Jackson $7 million for a reduced role. Moving forward, Jackson hopes to be another team’s primary option at tailback. Surely, someone will be giving Jackson a shot at being at the top of the depth chart, even if it’s only for a year or two. Seven months ago, David Garrard appeared poised to be named the starting quarterback of the Dolphins. Now he’s just asking the Dolphins for a roster spot and saying he’d gladly serve as Ryan Tannehill’s backup. Unfortunately for Garrard, the Dolphins do not appear to be interested. After Garrard needed arthroscopic knee surgery in August, Tannehill emerged as the starter and Garrard was cut, and the Dolphins haven’t talked to Garrard about a return. Garrard had a workout with the Jets last week that he described a “great,” although the fact that he’s still talking about wanting a job elsewhere calls into question whether the Jets agree that it was great. The 35-year-old Garrard, who hasn’t appeared in a regular-season game since he was the Jaguars’ starter in 2010. 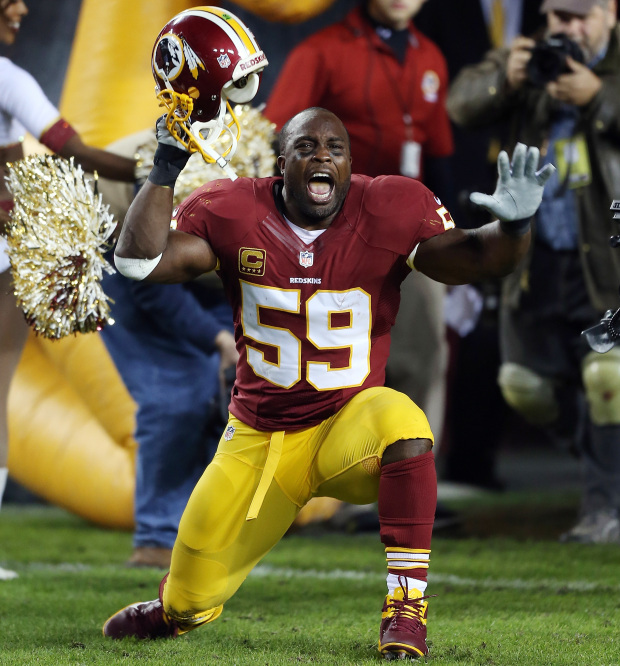 While Redskins coach Mike Shanahan recently created some doubt about London Fletcher’s future with the team, Fletcher himself said he’s coming back next year. The veteran linebacker told David Elfin of 106.7 The Fan that he was having ankle surgery this morning, in plans of returning to the field. “Surgery is the first step towards prepping for next season,” Fletcher said. Fletcher will also have surgery to clean up an elbow problem later this month, and the two procedures will be the first of his remarkable 15-year career. That he’s been able to play that long is amazing in and of itself, but to do so without needing surgical assistance is remarkable. And knowing that his intent is to play will be a significant bit of good news for the Redskins, who would have had a big hole to fill without the benefit of cap room or draft picks if he would have retired. The Patriots and wide receiver Wes Welker are reportedly making progress toward a new contract, which helps explain why the Patriots opted not to use their franchise tag on Welker even as a way to buy time for a new contract. Jason Cole of Yahoo! Sports reports that Welker is weighing a couple of different issues as he decides where to sign on for 2013 and beyond. One is whether he’d rather stay in a familiar role and offense with the Patriots for less money than he might be offered from another team and the other is whether that familiar role has been replaced by another one. Cole spoke to a source close to Welker who said that Welker is still “miffed” about the limited playing time and targets he received early last season. It’s left him with “mild disdain” for the team and offensive coordinator Josh McDaniels and reportedly stuck “in his craw” all season. 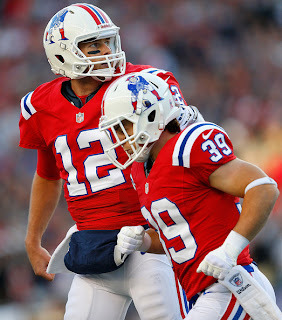 What’s more, Cole reports that there’s “a little paranoia” in Welker’s camp about what his role in the offense would be if Rob Gronkowski and Aaron Hernandez are healthy all season. Welker wound up with 118 catches last year, so it’s not like the early playing time was indicative of the way things went over the entire season. With Julian Edelman also heading for free agency and Brandon Lloyd reportedly on thin ice with the team, there’s a fair chance that Welker will be the only receiver with meaningful experience in the Patriots roster on the roster heading into next season. That doesn’t exactly set the stage for a limited role in the offense, but we’ll find out soon enough which way the wind is blowing in regard to Welker. The Chiefs did a lot of business in the hours before the franchise tag deadline, signing wide receiver Dwayne Bowe and punter Dustin Colquitt to long-term deals, and tagging left tackle Branden Albert. Now they have something even more valuable than good players — they have options. While many will immediately assume this takes them out of the market for a left tackle (specifically Luke Joeckel) with the first pick in a quarterback-less draft, that doesn’t seem wise. First, they should create the full impression that it’s still a possibility, if only to create a trade market that might not otherwise exist. But the realities of their line wouldn’t preclude drafting him anyway. Even though they just tagged Albert (keeping him there for a year, at $9.828 million), there’s no reason they can’t draft Joeckel, and have one of them play right tackle. While Eric Winson has been solid, he’s also entering his 30-year-old season, and isn’t so good that you’d bypass a potential left tackle because of him. And Albert’s back injury, which coach Andy Reid referred to as a “fairly significant injury” at the Combine, might also give them pause. At the very least, the uncertainty over Albert’s long-term health or contract status would make it wise to keep Joeckel as an option. Many also thought Albert was better suited to play guard when he entered the league, which creates another layer of possibility. With the chance at a solid offensive line in front of an average quarterback (the recently acquired Alex Smith), along with a good run game, a solid receiving threat in Bowe and a coaching staff that knows how to move the ball, it gives the Chiefs the chance at a new look on offense. And it gives them more options for the first pick, which makes it more valuable by definition. When the Bills signed quarterback Tarvaris Jackson to a new one-year deal, new coach Doug Marrone declared that there will be an open competition at the position. It will be hard for incumbent starter Ryan Fitzpatrick to compete if he’s not on the roster. If Fitzpatrick remains on the roster as of March 13, he’ll earn a $3 million roster bonus. Though the Bills haven’t said Fitzpatrick will be cut, they also haven’t declared unequivocally that he’ll stay. And while Marrone has informed Fitzpatrick of the open competition, he made it clear during our visit at the Scouting Combine that he has no influence over the decisions made by the front office. With the leader of the front office, G.M. 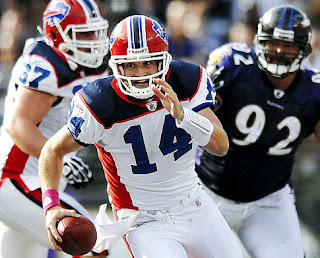 Buddy Nix, declaring during the 2012 season that he wants to have a “good young quarterback” regarded as a “franchise guy for the future in place” before Nix leaves and with no quarterback currently on the team fitting that description and with Jackson signed only weeks before he could have walked, the biggest question currently confronting the Bills is whether $3 million will be paid to Fitzpatrick in the near future — chased by a $200,000 workout bonus and a $4.35 million base salary during the season. Don’t be surprised if the answer is no. The fact that the Bills moved with some urgency to re-sign Jackson could be regarded as a sign that they didn’t want to enter free agency with neither Fitzpatrick nor Jackson under contract. So, if Fitzpatrick gets cut, the Bills will at least have Jackson signed and sealed as they search for other quarterbacks who can deliver. "We've done film evaluation, and our staff and (general manager) Howie (Roseman) will sit down together and see where we'll move forward," Kelly told the Philadelphia Inquirer. "But as a person, I think he's outstanding." A report this week called out Asomugha as something of an odd bird for eating lunch in his car alone instead of joining his teammates during practice breaks last season. But when Kelly huddled with Asomugha before the cornerback's recent trip to Nigeria, he walked away calling Asomugha a "classy" individual. On the field, Asomugha disappointed in 2012, and when asked about his 31-year-old defender at the combine, Kelly was enigmatic. "I think Nnamdi has the skill set ... that can play football," he said. If the Eagles retain Asomugha, it reportedly will be at a massively reduced cost. With defensive tackles Mike Patterson and Cullen Jenkins sent packing this week, you have to wonder if Asomugha will be next. Kelly wouldn't say much on that front. Let's keep in mind that his entire evaluation of the team boils down to film study. Kelly is forbidden to work with his players on the field until team activities get cracking next month. "It's the hand we're dealt, and we'll deal with it no matter how it comes out," Kelly said. "I know free agency starts on March 12, and we don't get a chance to see our guys until April 1, so we don't get to call a timeout and put everyone on hold until we can see." It’s been more than 30 minutes since the news broke of the deal negotiated between the Ravens and quarterback Joe Flacco. And there are no specifics yet on what Flacco will make. Adam Schefter of ESPN says that the deal is “expected” to make Flacco the highest paid quarterback in NFL history. The current high-water mark is the five year, $100 million contract given to Drew Brees by the Saints last year. This means that Flacco will make more than $20 million per year, if he’s indeed the new highest-paid quarterback in NFL history. There’s a rule of thumb in NFL circles regarding new contracts. If the numbers aren’t leaked within the first 24 hours, the player didn’t get what the player wanted to get. It may take a few days to get the information, since Flacco won’t be signing the deal until Monday. The Ravens will want him to put his name on the deal by 4:00 p.m. ET on Monday. If he’s not under contract by then, the Ravens won’t be able to use the franchise tag on him.